Assistive technology is any kind of technology that can be used to enhance the functional independence of a person with a physical or cognitive disability. Get the basics in this fact sheet from the Center on Technology and Disability. Download a PDF of this fact sheet (with examples of AT products). Why learn about assistive technology? Assistive technology (AT) makes it possible for individuals with disabilities to take part in life’s activities, at home, school, work, and in the community. It strengthens developmental, functional, and learning skills. It can substitute for abilities that a person may not be able to develop. For instance, a person may not have use of her voice, but AT can allow her to communicate her thoughts, wants, and needs. No one is too young or too old to benefit from AT. Assistive technology includes a wide range of tools, from a simple, low-tech device such as a magnifying glass, to a complex, high-tech device, such as a computerized communication system. AT products can be made by hand, purchased off the shelf, or adapted from an existing product. Assistive technology services help individuals acquire and use AT devices. They include, but are not limited to: assessment of an individual’s need for specific AT items, “trialing” of potential devices, training for all involved, maintenance of devices, and evaluation of the individual’s experience with selected items. Sometimes an item that is not thought of as assistive technology will fall into the AT category if it permits someone to accomplish a task that he could not successfully complete otherwise. An example would be the use of a calculator in school. For some students, a calculator may provide an easier, faster way of solving a math problem. For students with certain physical and/or intellectual disabilities, the calculator may be essential to their ability to solve the same prob- lem. For those students, the calculator becomes assistive technology and its use may be approved in an Individualized Education Program (IEP). Infants, toddlers, children, and young adults may use assistive technology to help them move, communicate, learn, work, and socialize. In most cases, the AT devices that a person uses will change over time, as s/he grows and develops physically, intellectually, and emotionally. This is particularly the case with young children and youth. AT appropriate for a 3-year old will rarely be suitable for a 7-year old or a 12-year old. It’s important, therefore, to regularly evaluate a child’s needs and experiences with his or her devices, services, and accommodations. In thinking about the potential value of AT to a particular child, remember that not all disabilities are identified formally. Many children have “invisible” disabilities which may or may not have been diagnosed by a doctor or ser- vice provider. Yet these can have a powerful impact on a child’s ability to develop, learn, and socialize with peers and adults. Some of the disabilities that often fall into the “invisible” category are learning disabilities, print disabilities, auditory processing disorders, and emotional/behavioral control. Children with both diagnosed and undiagnosed disabilities, whether visible or invisible, can benefit from appropriate assistive technology. It is more difficult, however to acquire AT through public agencies, including school systems, without a diagnosis. For children age 0-3, a diagnosis will, in most cases, trigger the development of a Family Individualized Service Program (IFSP); for children and youth age 4-22, the development of an Individualized Education Program (IEP). Federal law — the Individuals with Disabilities Education Act (IDEA) — requires that the IEP process include consideration of a child’s need for accommodations, including assistive technology. (Please note that not all accommodations are AT. Non-AT accommodations may include additional time when taking tests, the ability to access a resource room for quiet time, the assignment of a study buddy, or the assignment of easier, modified homework.) See also: Assistive Technology and the IEP. To determine the assistive technology needs of a child, an AT assessment should be conducted. The assessment can be conducted by the child’s school, an independent agency, or an individual consultant. The assessment should take place in the child’s customary environments; most often that will be at home or at school. It is important that the assessment address the child’s strengths as well as his or her weaknesses. The perspectives of teachers, parents and service providers are important, as well as that of the child. The discussion should include the ways in which the child communicates, what he or she likes and dislikes, and what kind of strategies and interventions might be helpful. Consider how a child’s need for AT might change depending on the environment, for example, in the classroom, on the playground, at a friend’s house, or in a public place such as a shopping mall or library. That type of input will provide clues as to what technology might work and how well the child will respond to it. If an AT assessment is conducted as part of a student’s IEP process and it is determined that one or more AT devices and/or software would help achieve the goals identified in the IEP, then the school system is required by law to provide the AT. The school has flexibility in choosing among products that meet the student’s needs and the products may be acquired from the school system’s equipment re-use inventory, but it must provide the features identified in the AT assessment. Computer apps for tablets and phones can help infants and toddlers with developmental delays learn cause and effect and facial expressions. Used by the child with an adult, such apps provide the type of early in- tervention that can help narrow or even eliminate a young child’s delays. Many toys can be easily adapted or purchased of the shelf to be accessible by children with fine or gross motor weaknesses. These include puzzles with knobs, motion toys with big button switches, push or ride-on toys with wheels wrapped in Velcro for stability, and game pieces with handles. Learning materials can be similarly adapted. Adding a handle to a ruler, page “fluffers” to books, or 3-D stickers to blocks can help a child independently participate in classroom activities. Timers, task reminders, visual cues, and “first-this-then-that software programs help students make transitions between activities. Audio versions of books are available through a number of sources, including Bookshare and community and school libraries. For students with learning disabilities, there are a wide range of idea organizers for help in understanding lessons and text content. They also help a student organize his or her thoughts and written assignments. A teacher might allow a student with disabilities to submit an audio or visual report instead of a written essay, using the audio recording or picture-taking functions on their cell phone or tablet computer. Other AT tools that are widely available through computers and mobile devices include voice recognition, screen enlargement, and font controls. These are no longer high-price accessibility tools available through specialty catalogues, but are routinely built in to widely available consumer devices. With minimum effort, they can be easily customized to each individual’s needs. AT items that support mobility and independence include hand-held GPS (global positioning system) devices and apps that help people with visual impairments navigate city streets and use public transportation. 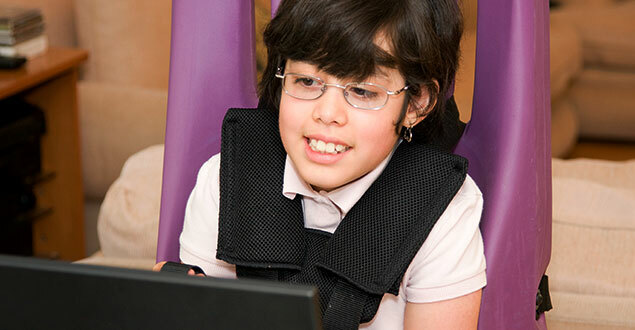 Assistive technology can also help children, youth, and adults participate in recreational and community activities. Increasingly, communities are investing in accessible playgrounds so that all children can play safely. Adapted equipment allows youth to play such sports as baseball, basketball, and tennis. Accessibly designed movie theaters provide closed captioning and audio description for moviegoers with hearing and visual difficulties. Devices to assist a person with “activities of daily living (ADLs)”, such as cooking, dressing, and grooming, help individuals of all ages. A medication dispenser with an alarm can be set to remind a child or adult to take daily medication. Talking clocks, scales, and measuring cups help those with visual impairments. Dressing sticks and long- handled brushes encourage independence, as do reaching tools, color-coded labels, and a large variety of mobile apps that provide visual cues to the steps in an activity. You don’t have to become a “techie” to help an infant, child, young adult, or adult with disabilities access and use AT. Through websites, YouTube videos, and social media networks, it’s easier than ever to not only learn AT basics, but to stay on top of new technology products as they become available. Whether you’re someone with a disability, a family member, teacher, service provider, or any concerned individual, you simply need a willingness to invest time to learn and a belief that AT can make the seemingly impossible, possible. There are many organizations that provide AT information and training to consumers, families, and educators, such as parent training and Information centers, state assistive technology programs, disability-specific organizations, and rehabilitation centers. If possible, you should visit an AT center that provides demonstrations and workshops and that may loan devices for users to try. Please return to the Center on Technology and Disability website regularly to look for new resources. You can also sign up to receive an announcement of upcoming webinars and newly released guides, videos, infographics, and fact sheets. We look forward to seeing you online! The Center on Technology and Disability (CTD) helps children and youth with disabilities and their families, teachers, and service providers by providing a wide range of resources on assistive and instructional technology tools. CTD is funded by the U.S. Department of Education, Office of Special Education Programs (OSEP) under award #H327F130003.